Ideal for repelling Geese, Ducks, and other Water Fowl! Popular with hunters for years, decoys function as a new, more humane goose and critter repellent. A safe, humane, and effective way to rid your property of these unwanted pests without causing harm. Compact 2-piece stake fits anywhere. Center stake design allows the decoy to move with the slightest breeze and fur tail adds more motion and realism. Realistic, three-dimensional, portable and easy to set-up or take down. 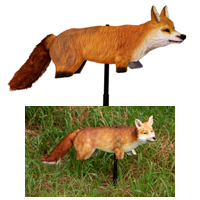 The Fox 3D Decoy deters birds with a menacing appearance, but it doesn't harm them or the environment. Dimensions When Set Up: 28" x 14" x 5"